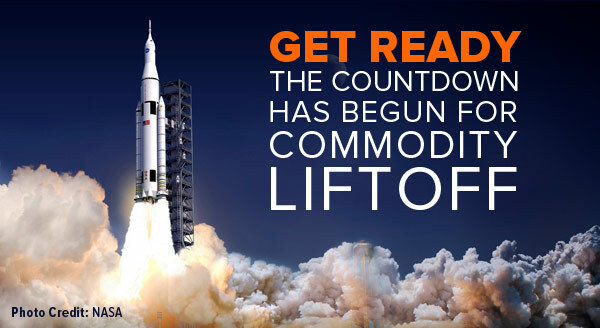 Get Ready for Commodity Liftoff: Global Manufacturing Just Made a HUGE Move! By most standards, October was an explosive month, with domestic equities recording their biggest monthly gains in four years. But the most exciting news was that the global purchasing managers’ index (PMI) reading for the month of October rocketed up to 51.4, almost a point higher than September’s 50.7. Not only does this represent the strongest monthly surge in nearly two years, but the index shot above its three-month moving average for the first time since March. As Donald Trump might say: This is going to be huge. We monitor the global PMI very closely because in the past it has reliably anticipated how commodity prices might behave in later months. 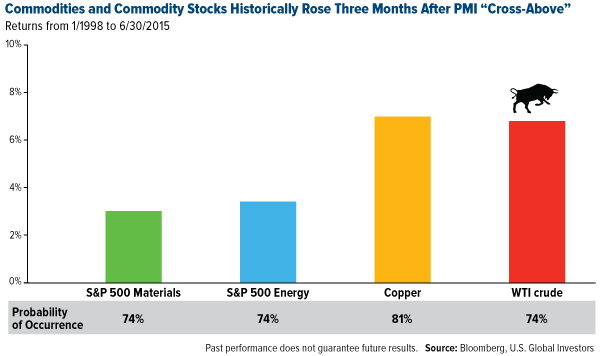 Our own research shows that when a PMI “cross-above” occurs—that is, when the monthly reading crosses above the three-month moving average—it has signaled a possible spike in certain commodities, materials and energy. Three months following previous breakouts, copper had an 81 percent probabilty of rising approximately 7 percent, while crude oil jumped 7 percent three quarters of the time. 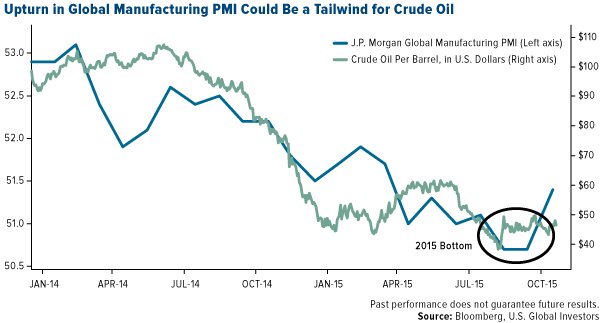 Indeed, oil prices have tended to track the global PMI pretty closely. With manufacturing exploding off the launch pad, could oil be very far behind? 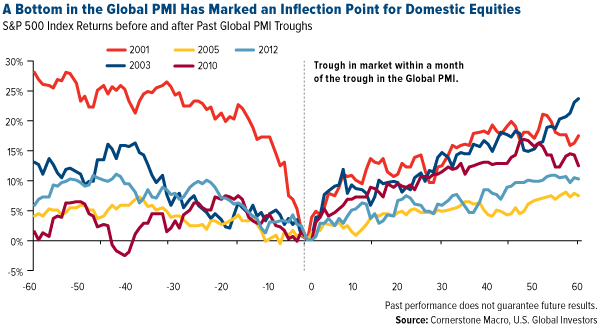 What’s more, domestic equities are strongly correlated with global PMI readings. Investment research firm Cornerstone Macro shows that in five separate incidences since 2001, a PMI liftoff after hitting a bottom was soon followed by a rally in the S&P 500 Index. A similar trend can be observed in world equities. In the past, the MSCI World Index has rallied when the global PMI turned up. Brian Hicks, portfolio manager of our Global Resources Fund (PSPFX), agrees that the PMI reading is promising. “It’s definitely constructive for commodities going forward,” he said. One of our holdings in PSPFX, by the way, had a huge jump this week. British Columbia-based Sunridge Gold announced that it would be selling its 60 percent interest in the Asmara Mining Share Company, holder of the Asmara Project in northeastern Africa, to Sichuan Road & Bridge Mining Investment Development, a Chinese company, for $65 million. Sunridge jumped 41 percent this week alone and for the year is up 71 percent. Did I mention that U.S. Global Investors is the largest holder of Sunridge stock (by a very wide margin)? That’s the power of active portfolio management. So When Will Liftoff Occur? As exciting as this news already is, we believe the real commodity liftoff should occur when the U.S., Europe, China and global PMIs all score above a 50.0, with the one-month readings above the three-month trends. Of those regions, China is the only one whose reading still trails below the 50.0 level. For the month of October, it came in at 48.3, up from 47.2 in September. 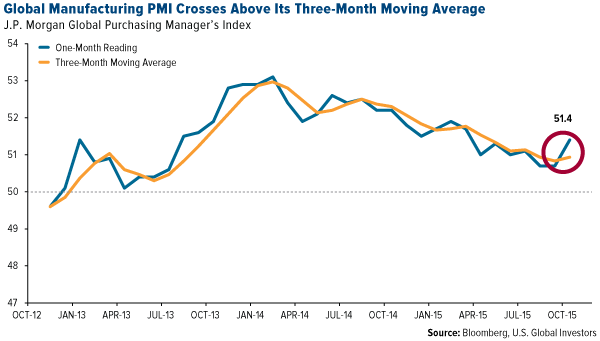 But like the global PMI, the China PMI crossed above its three-month moving average, suggesting that manufacturing activity is contracting at a slower pace and preparing to reverse course into expansion mode. It’s crucial that China’s PMI move above 50.0, as the Asian giant is the top driver of global commodities demand. We believe that once purchases, new orders and exports gain further momentum, commodities might have the fuel they need to skyrocket. Next Article Gold finding short term bottom?